Burkitt’s lymphoma is a very rare form of cancer. There are about 300 new cases in the United States every year. It is a fast growing cancer and was first described in 1956 by the British surgeon Dennis Burkitt. 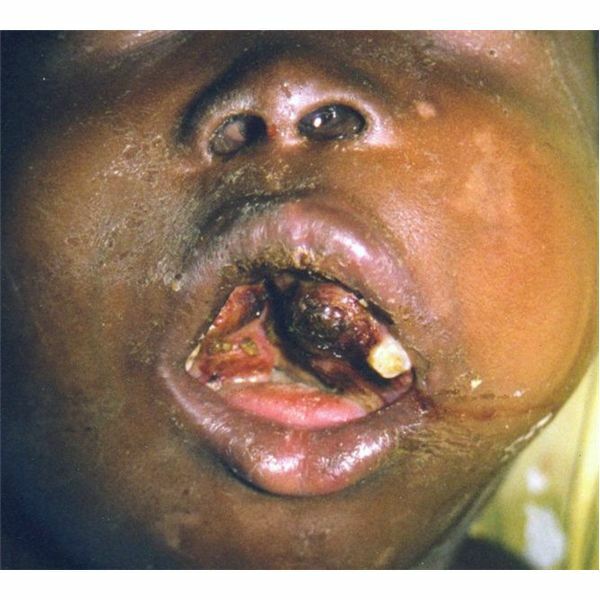 He was working in central Africa and observed the condition, which was more common in children. Later research revealed that children with the condition had been infected by the Epstein-Barr virus (EBV). The invading pathogen targets B-lymphocytes and it usually doesn’t cause any long term problems. However, these children had chronic malaria infections which reduced the effectiveness of their immune systems. This allowed the Epstein-Bar virus to turn the B-lymphocytes into cancerous cells in some cases. The north American form of Burkitt’s is not linked to EBV. At the time of writing (November 2009) researchers are intensively studying the disease as its specific cause is unknown. Not everyone who develops the condition has the EBV virus. However, things are becoming a little clearer. It is suspected that genetics and exposure to the virus increase an individual’s risk. In many cases there is a chromosomal rearrangement between chromosome 8 and chromosome 14. This causes genes to change position which leads to uncontrolled cell growth. Burkitt’s lymphoma is treated with chemotherapy and the outlook is good for more than 50% of patients who undergo intensive treatments. Other types of treatments can include radiation therapy and steam cell transplants. Gene therapy is not a current treatment option for people with Burkitt’s lymphoma, but studies that increase our insight into the causes of this cancer may one day make some form of gene manipulation likely. Burkitt’s lymphoma affects the part of the immune system known as the lymphatic system. It consists of a network of glands, tissues and channels and produces a type of white blood cell known as the lymphocyte. There are two types of lymphocytes – B cells (produce antibodies) and T cells (regulate the immune system). In 1982 scientists discovered an oncogene – that is a gene that causes cell growth to spiral out of control – inside the B cells of 90% of people with Burkitt’s lymphoma. The oncogene is called C-myc. Then in 2000 researchers found another gene that contributes to the development of this cancer. It’s called HMG-I/Y and what appears to happen is that the C-myc oncogene stimulates HMG-I/Y which triggers the changes in B cells that cause them to multiply rapidly and form a tumour. In 2006 scientists from the University of Nebraska Medical Center and other institutions identified the correct gene expression for Burkitt’s lymphoma. This was important research as it then made it possible for researchers to make a distinction between Burkitt’s and another very similar type of cancer called diffuse large B cell lymphoma. The conditions are treated and managed differently. Scientists from Italy have been able to block the growth of Burkitt’s lymphoma cells. This was first demonstrated in culture where a peptide nucleic acid (PNA) inhibited growth. Then later a PNA was used to block tumour growth in mice models that had been injected with human BL cell lines. The PNA was specific to a regulatory region of C-myc and the results showed that there was down regulation of this oncogene. This opens up the potential for a therapy that uses a PNA to target non-coding regulatory regions of the C-myc oncogene.